It’s not easy to find a BYOB in Philly that will accept reservations for ten on a Saturday night. 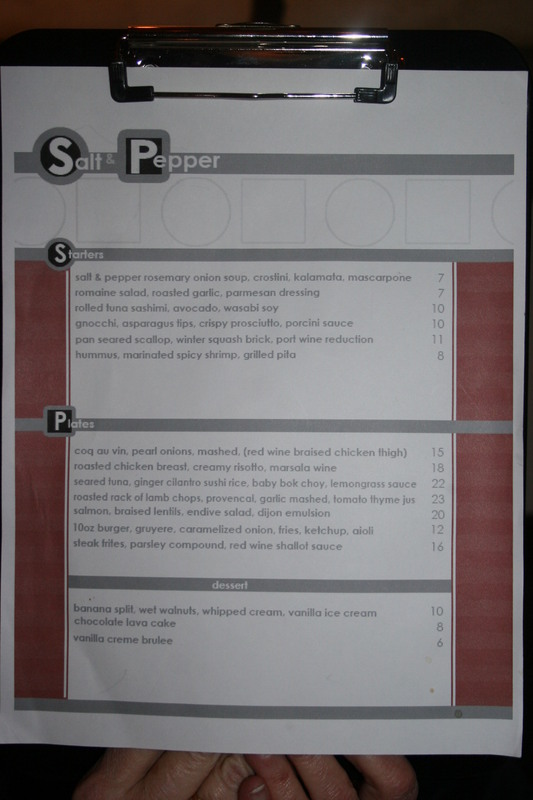 Some will offer a 5:00 P.M. or 9:30 P.M. seating but I was fortunate to find Salt and Pepper with a 6:30 P.M. opening. A few words on this place before I begin. 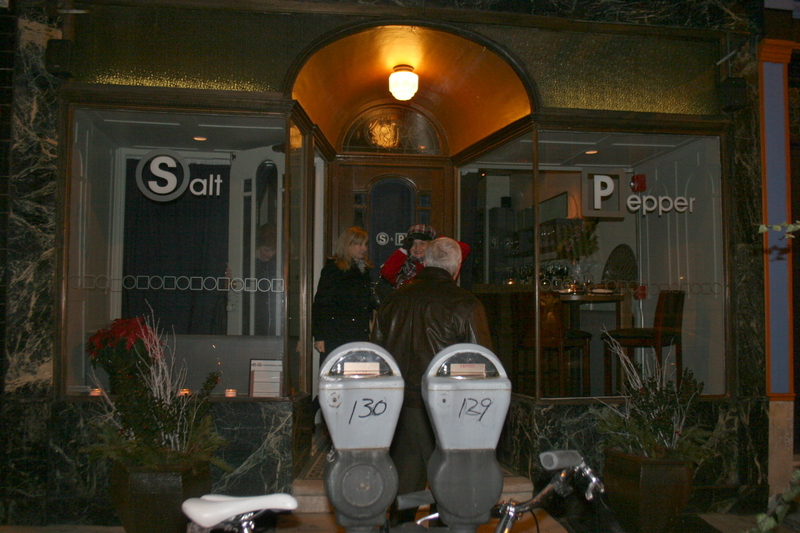 Salt and Pepper has recently moved from their home at 6th and Tasker and are now located in the 1600 block of E. Passyunk Ave. There are quite a few restaurants in this same area which leads to the monumental problem of finding a place to park in this South Philly neighborhood. There is a municipal lot almost directly in front of Salt and Pepper but you have a better chance hitting the lottery than finding an empty spot there on a Saturday evening. A couple of enterprising entrepreneurs are stationed on the street offering “valet parking” for $8.00 and although I have no idea where they stash your car during your time in the restaurant, this may be your best option. Somehow, our entire group eventually resolved the parking dilemma and by 6:45 we were all seated and looking over the menu. It’s not an extensive menu but there are enough interesting choices in each group to satisfy everyone. 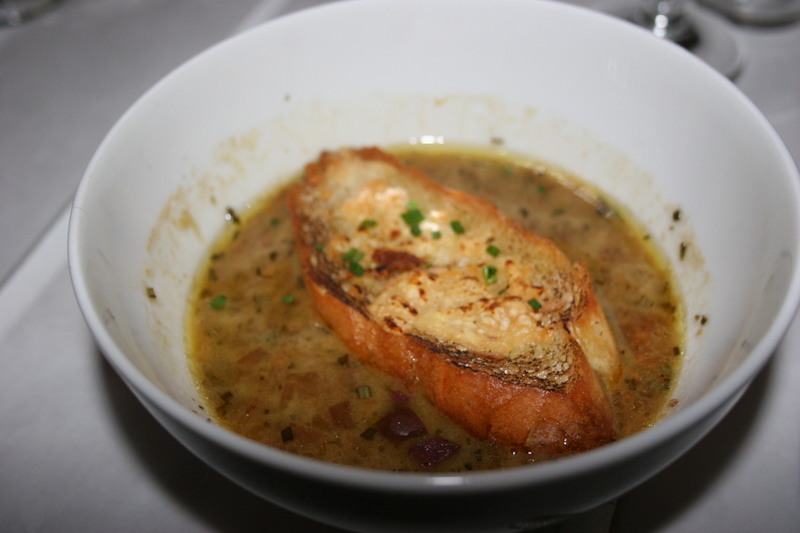 Several of us, myself included, began with the Salt and Pepper Rosemary Onion Soup. This is an unusual take on French Onion Soup and includes a crostini, Kalamada olives and marscapone cheese. I’m not sure how or why but, it works. and all who chose this starter thought it was terrific. I’m not sure what this soup was but it was the only addition to the regula menu on this evening and I remember it looking interesting but I can’t recall who had it. 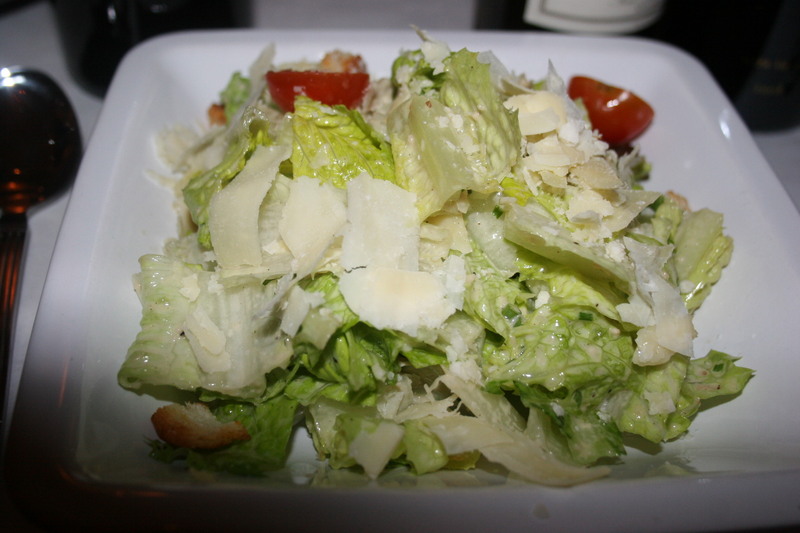 I know my wife, Kathy and others ordered the Romaine Salad, roasted garlic and parmesan cheese and found the dish to be crisp and flavorful. 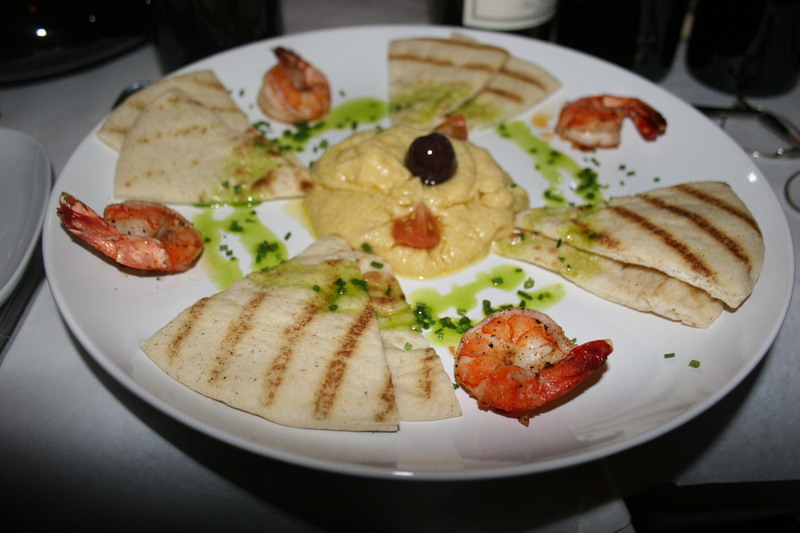 The final appetizer chosen was the Hummus, marinated spiced shrimp and grilled pita. This was a nice presentation and shared by several in our party. 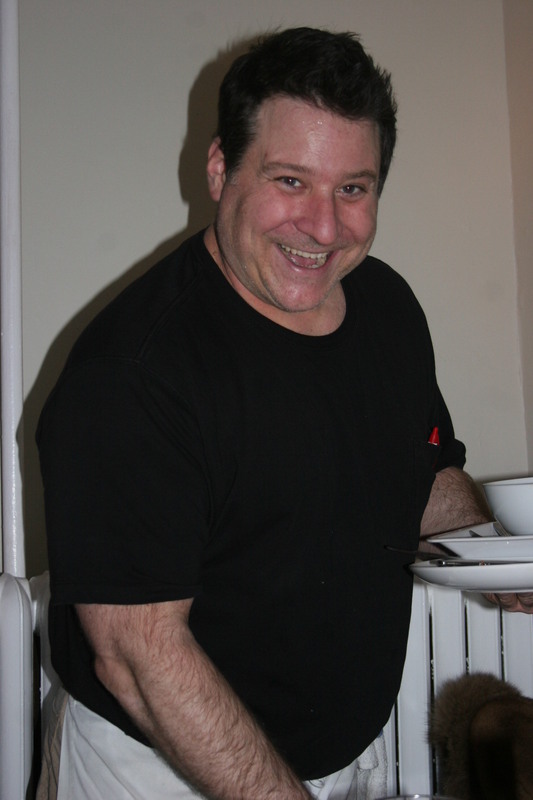 Our server for the evening, Matthew, was excellent. He opened our many bottles of wine, brought ice for the whites and assisted us with our entree selections. It was evident that Matthew takes pride in his performance and he was both personable and efficient. Normally, it is about here that I would mention the wines that we were drinking at this dinner. I am going to refrain from that and use a new post to give a complete review of those wines. The reason is, there were just so many really good wines that they truly deserve their own space. 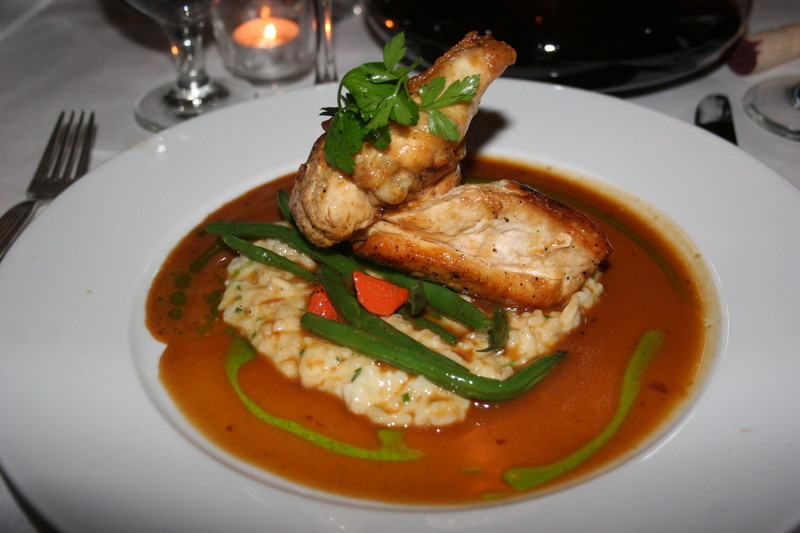 For my entree, I chose the Roasted Chicken Breast, creamy risotto and a marsala wine sauce. The presentation was superb and the chicken was cooked to perfection. 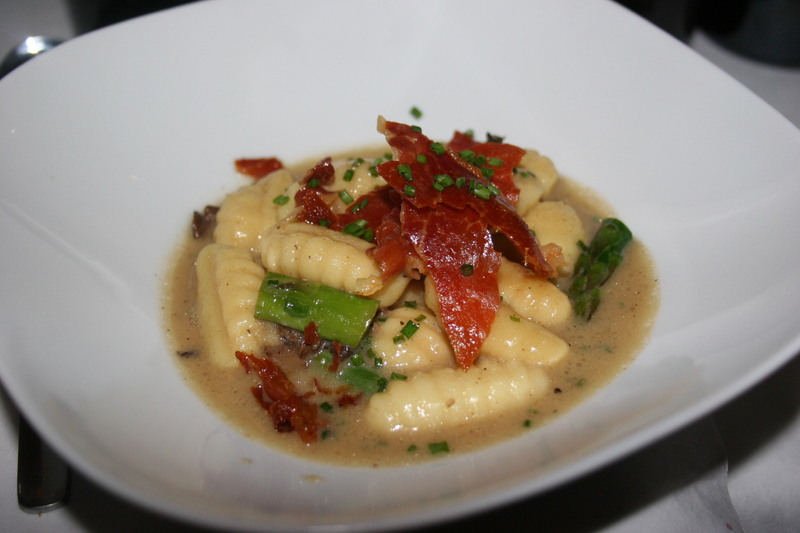 The risotto was delightful and the marsala sauce provided just the right topping to a wonderful dish. I could not have been happier with my choice. 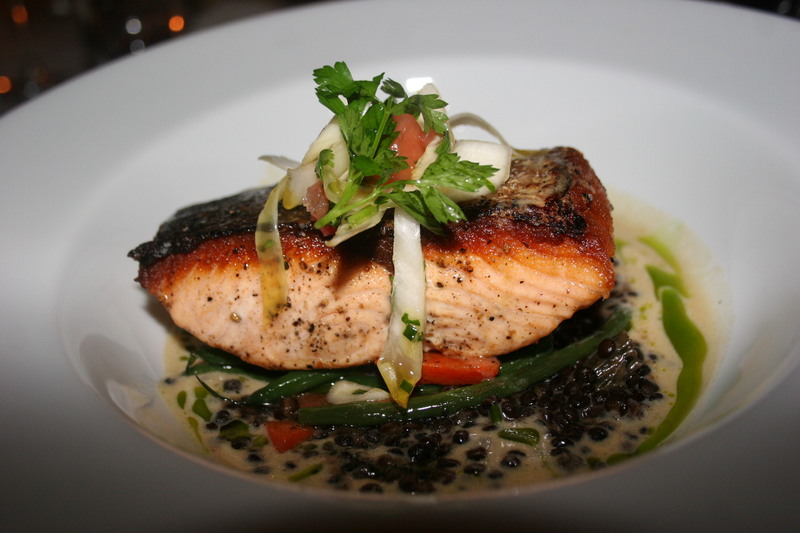 With so many people at the table I gave up trying to remember exactly who had what but I do know a couple of folks ordered the Salmon, braised lentils, endive salad in a dijon emulsion. The fish appeared to be cooked perfectly and I think they enjoyed the entire presentation. 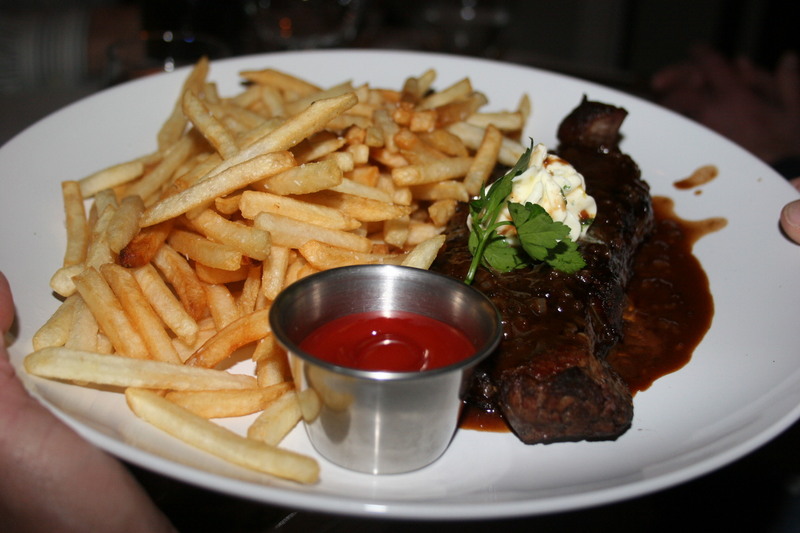 The steak lovers in our group selected the Steak Frites, parsley compound and red wine shallot sauce The steak appeared to be cooked as ordered and the fries were crisp and golden brown. 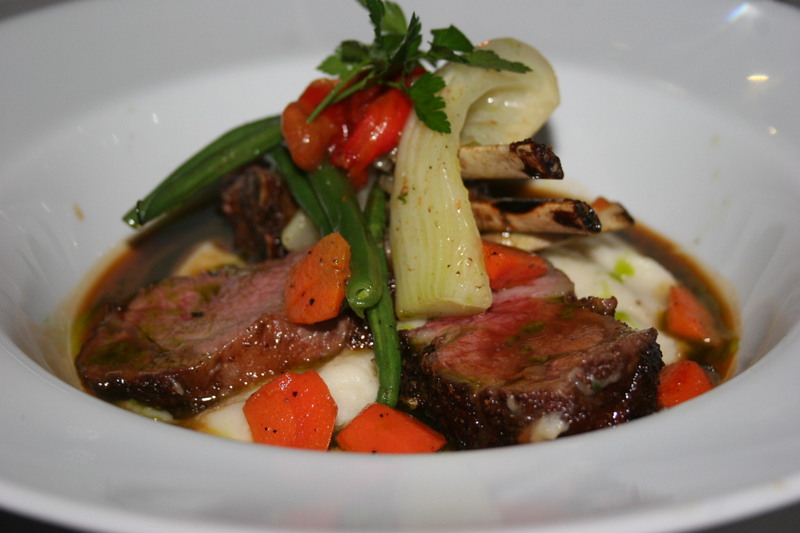 There had to be one lamb lover in our midst and I’m quite sure it was Gerry who selected the Roasted Rack of Lamb, provencal garlic mashed potatoes and tomato thyme juice. I’m not big on lamb but this looked great and I think tasted just as good as it looked. The conversation was every bit as good as the wines and we lingered for quite some time . 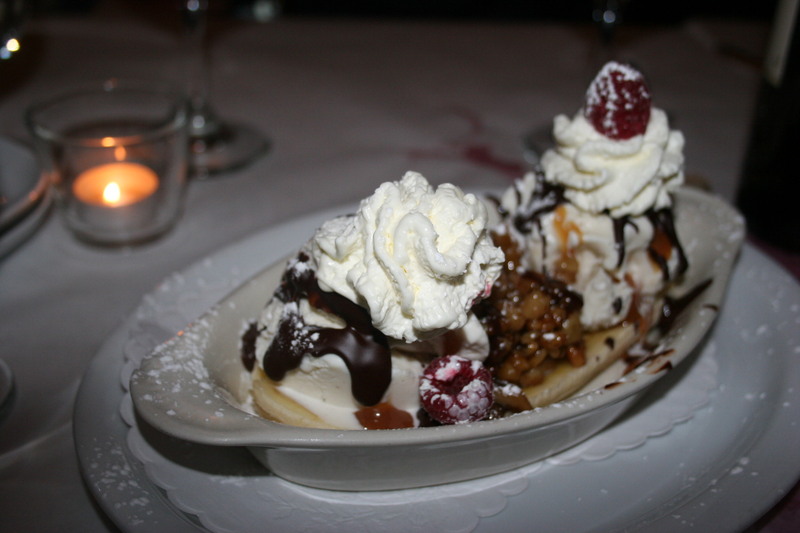 Kathy and I found that we had room for dessert and decided to split the Banana Split, wet walnuts, vanilla ice cream and whipped cream. We probably didn’t need this but we made a determined effort and finished each morsel of our portion. 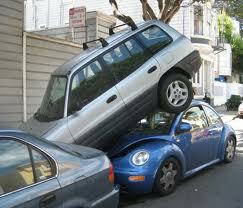 A restaurant has to be pretty damn good for me to admit that it was worth fighting the “parking wars” to eat there. I’d say that Salt and Pepper was worth it. One final word of caution. Salt and Pepper is no longer a BYOB. They have a liquor license and permit BYOB on Tuesdays and Wednesdays only. They allowed us to bring our bottles and pay a $10.00 per bottle “corkage fee” because many people are not yet aware of their change of status. If bringing wine is important to you it would be wise to work out the details with the staff prior to booking.